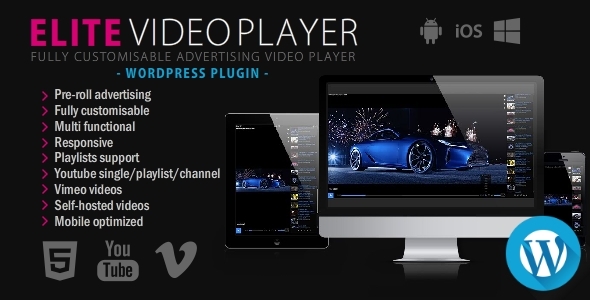 Elite Video Player is modern, responsive, fully customisable high-end video player for WordPress that support advertising and the most popular video platforms like YouTube (single, channel, playlist), Vimeo, self-hosting videos (only mp4 required) and Google drive videos. Showcase your videos in your site across all browsers & devices with this unique and most powerful video player around. Installation is super easy. Simply choose video player type and insert the shortcode in your page or post.